Yesterday, I came across a new Ad on TV with a new fancy brand ‘Foodles’ being promoted under the umbrella brand of Horlicks products. Again, this morning I saw the print media Ad for Foodles. Thus, thought of writing about a little different subject today, especially because an able competitor seems to have arrived for my favorite noodles brand – Maggi! 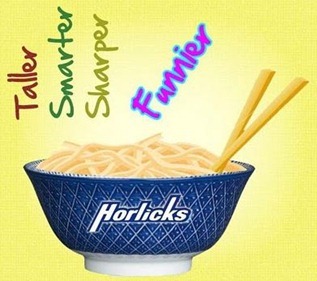 The health drink brand from GSKCH – Horlicks – which has been traditionally targeted as a ‘great family nourisher,’ has entered into the highly competitive segment of instant noodles through its newly introduced Horlicks Foodles, aimed to explore the category of salty snack food market. Yummy! Did I say ‘Maggi’ above? Well, not quite, but when it comes to noodles, the brand name Maggi instantly pops-up in front of us, closely associated with a hot steaming bowl of soft noodles. That’s the level of dominance that Nestle’s Maggi holds over the market share of instant noodles. While Horlicks has been breaking new grounds with a series of health drink variants aiming at the entire family segment, its entry into the noodle’s segment comes as a pleasant surprise. Though, not a shocker- as the business of Rs.1100 crore packaged-noodles market as well seems to be a recession-proof one. But, a billion dollar question is – Can Horlicks storm into the Maggi’s stronghold over the noodles market share? Currently, Maggi Masala-flavoured maida noodles commands a dominant share of around 90% of the instant noodles market. Well, if one goes by the rebellious promotional Ad campaigns that GSK had initiated against Heinz, the makers of Complan, it can be presumed that Horlicks won’t just accept whatever lies on the table in terms of untapped market share for noodles – but will certainly try to penetrate and grab Maggi’s target customers as well. In order to breach the numero uno position of the Maggi’s stronghold in the market of usual processed flour noodles; Horlicks Foodles seems to have, rightly, attempted to grab a share of this larger pie by sticking to its ever-green mantra of providing ‘health and nutritious’ food products. Take this – GSK’s internal studies showed that instant noodle is not a healthy snack. It found that mothers felt guilty serving the maida-clad noodles to children as against aata or wholegrain wheat variants. Taking clue from this fact, GSK seems to have decided to tap this bigger opportunity to position itself differently and get being heard as a provider of healthy snack foods as a variant of instant noodles. Thus, Horlicks kick-off the Foodles offerings in two healthy variants: Regular and 4 Grain. Both variants come with a trademarked Healthmaker sachet which has 9 Power Vitamins. Besides, the 4 Grain variant is made with nutritious grains like Rice, Ragi, Wheat and Corn. As a sub-variant, each of the two varieties comes in three different flavours. But, a point to be noted here is that Maggi already has presence in the healthier noodle varieties like dal aata noodles made of whole wheat flour and pulses, rice noodles made of rice flour and Vegetable aata noodles with whole wheat flour and vegetables; though with little contribution to its turnover from these segments. The snack food in Noodles as such has no nutrition value (In fact, it is often criticized as a junk food) but when it is combined with veggies – it tastes better (Probably better than the plain maida variant!) and could also form a healthy snack for kids. P.S. : In the GSKCH’s Ad for Foodles, a brand of “nourishing noodles”, carries a disclaimer that says the product is “nourishing vs. other regular instant noodles” and when eaten one-two times per week as part of a balanced diet”. But,no. whisper about him on the Foodles wrapper! Even I agree partially with you, that this cannot help or negate the already existant positioning of Brand Horlicks in the market. Only thing that can happen in this case is that it can help the foodles as the positioning of foodles in the market matches the positioning that Horlicks as a brand has in the market. I feel there is another angle to this new product. The bucket of Horlicks products have been considered as nutritious healthy products since ever by the consumers. Adding a product Foodles, which is many a times considered as junk food and surely does not have any nutritive value may prove contrary to the Horlicks current image. Such opposite products being marketed under the same banner may not act very well for the company’s image. @dreanz2achieve… I agree with you, that Foodles is not going to improve Horlicks’ reputation as a health-related brand. In fact, I never considered Horlicks or for that matter even Complan/Boost as health drinks. They’re more of ‘Taste Enhancers’ to be used in Milk by the people (especially children). As a sub-variant, each of the two varieties comes in three different flavours.